SafeGard CC-8400Zn - is a RoHS compliant chromate free chemical conversion coating that will give you better paint and adhesive adhesion than hexavalent chromate conversion coating. SafeGard CC is not affected by heat and will not dry out or get "mud cracks" the way standard chromate conversion coating do. This is due the fact that this chemical conversion coating reacts quickly with zinc at the molecular level it is not just a barrier coating but a true conductive conversion coating. The process should be used on zinc castings, zinc plated steel and galvanized steel. The SafeGard process is easy to control and can be applied by spray, brush or dip. SafeGard CC-8400Zn Meets the ASTM Standard B-940-05 Chromate-Free Chemical Conversion Coatings on Zinc Surfaces. SafeGard CC-CC-8400 is a dry in place one tank chromate-free conversion coating for zinc and galvanized steel. This product reacts with the zinc to form a clear corrosion resistant coating. The picture below shows the results of a 5 week stack test. Why do people use galvanizing or galvanneal? It is well known that steel rusts when left unprotected in almost any environment. Applying a thin coating of zinc to steel is an effective and economical way to protect steel from corrosion. Zinc coatings protect steel by providing a physical barrier as well as cathodic protection to the underlying steel. The main mechanism by which galvanized coatings protect steel is by providing an impervious barrier that will not allow moisture to contact steel. Without moisture (the necessary electrolyte), there is no corrosion. However, zinc is a reactive metal and will corrode slowly overtime. For this reason, the protection offered by galvanized coatings is proportional to the coatings thickness. When the base metal is exposed, e.g. by cutting or scratching, the steel is protected by sacrificial corrosion of the zinc coating adjacent to the steel. This is due to the fact that that zinc is more electronegative (more reactive) than steel in the galvanic series. How long do galvanized coating last? The durability of a zinc based coatings is often a function of the amount of wetness (or dampness) of the installation location and the composition of the atmosphere. Water leakage, excessive humidity or condensation will accelerate the corrosion of galvanized coatings. What are the methods of preventing white rust formation? There are a number of steps that can reduce the formation of white rust or other oxidation products. These include keeping the packed work dry, packing the items to permit air circulation between the surfaces, stacking the packed items to allow water to drain, and treating the surface with a water repellent or barrier coatings to prevent moisture contact with the galvanized surface. In the past the typical passivating solutions utilized either a dichromate or chromate composition. Reliance on hexavalent or trivalent chemistry has its drawbacks. Hexavalent chromium is extremely toxic and more costly to work with due to special disposals procedures and permits, not even mentioning future liabilities. Also trivalent chromium’s do not work as well and can oxidize back into the toxic hexavalent chromium state. Now YOU can use RoHS compliant chromium-free SafeGard CC-8400Zn to extend the life of your galvanized, galvannealed, and galvalume coating. SafeGard CC-8400Zn is applied to newly galvanized steel while the steel is at a high temperature to obtain a conversion coating between the zinc surface and the SafeGard CC-8400Zn. After the galvanized steel is removed it must be quenched in a SafeGard CC-8400Zn bath while the galvanizing is still hot. The optimum range of going into the galvanized steel going into the quench tank is 325F to 450F. The conversion coating of the SafeGard CC-8400 to the zinc surface is complete in less than 1 minute. Bath temperatures from 120F to 180F offer the most consistent appearance and performance. Temperatures exceeding 180F may reduce the performance of the product. NOTE: This far exceeds the corrosion requirements of 120 hours as specified in "General Motors" specification "GMW 3044" and the "ASTM B 201" specification for clear or metallic colored Chromate based coating systems on zinc. The ASTM 201 only asks for 24 hours salt spray "clear" or metallic colored parts. 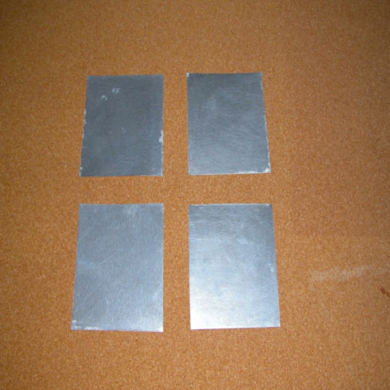 Electrodeposited, a 0.0003 inch thick coating of zinc was electrodeposited on a 1010 alloy steel panel which was then rinsed in mineral free water and placed in a solution CC-8400Zn for five seconds, removed and dried with hot air at 350 degrees F. The metallic zinc colored panels were then cooled to ambient temperatures and placed in a neutral salt spray cabinet according to ASTM specification "B117". The panels showed no signs of white corrosion after 150 hours of exposure. NOTE: This far exceeds the General Motors" specification "GMW 3044", the "ASTM B 201" specification and the "ASTM B 633" specifications for electrodeposited clear zinc Chromate panels. ASTM B 633 only references ASTM 201 for salt spray testing. If the galvanized coating is not fresh and zinc oxide has formed on the surface then it must, be removed before coating application. To remove the zinc oxide and prepare the surface to accept the SafeGard CC-8400Zn conversion coating reaction, use either Sanchem 560 or Sanchem 550 at 3-4 oz per gallon. The cleaner will be operated at ambient temperature. The surface should be cleaned long enough to achieve a water-break free finish (water does not bead up) then apply the SafeGard CC-8400Zn and either let dry or heat dry if desired. Copyright © 2015 - 2019 Sanchem, Inc.